With a few changes, auto-rickshaws could become ideal transport for persons with disabilities trying to connect with public transit. Photo by Pinreader. Bus rapid transit (BRT) and other bus and rail modes are becoming increasingly accessible for seniors, passengers with disabilities, and others who benefit from universal access. Such passengers include blind or sight-impaired persons; frail seniors, tourists, visitors and others who find it difficult to navigate a transport system; persons with hidden disabilities such as arthritis or heart disease, and of course those using crutches, wheelchairs, and other mobility aids. But there is a missing link: the final mile. The common option of walking may not work for most passengers with disabilities who cannot navigate between a transit stop and their destination. You may think the solution lies with taxis, or other expensive solutions, but a majority of disabled persons live on low incomes. Many cannot afford expensive modes like taxis and may not be able to access buses with high steps. 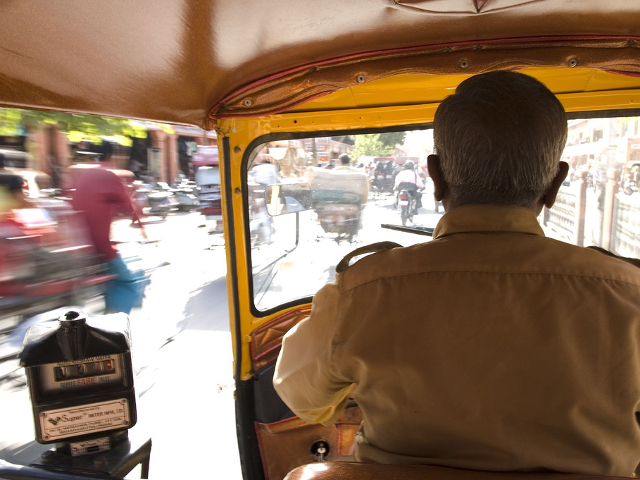 Fortunately, new thinking and new service models for auto-rickshaws may provide a missing link in many developing countries to put the transport puzzle together for passengers with mobility, sensory, or cognitive concerns. Auto- and cycle- rickshaws and similar vehicles around the world are less expensive than cars. They are often used in central cities or in outlying neighborhoods in India, Bangladesh, Nigeria, Peru and other countries in Asia, Africa, and Latin America. Their incorporation into public transport options for those with disabilities would revolutionize their mobility by lowering fares so that they would be within the reach of additional millions of seniors and disabled persons. The introduction of dispatch centers by auto or cycle-rickshaw companies solves a critical problem for many disabled persons: how to hail vehicles that may only ply busy streets several blocks from where they live. Dispatch centers enable persons with disabilities to ask for a vehicle to be dispatched directly to where they live, which may enhance their ability to access lower-cost public transport. GPS units on smaller vehicles now permit dispatchers to conveniently link riders with nearby drivers. While auto-rickshaws generally have low floors that facilitate entry, modest design changes may further increase their accessibility. Such changes could include well-placed hand grasps for all passengers, and some padding to protect passengers from being thrown against hard surfaces in the rough and tumble city traffic. Additionally, some models of auto-rickshaws provide a space behind the passenger cabin so that wheelchair users who can transfer to a passenger seat can store their folded wheelchair. Training drivers in courtesy and sensitivity to disabled passengers should be included in the training for auto-rickshaw drivers, ensuring that disabled passengers have a comfortable ride in every way. The introduction of seat belts should also be considered, beginning with vehicle fleets catering to specialized markets. In cultures where the independent living movement for disabled persons is only a recent trend, disabled people often find they must travel with relatives and friends, sharply circumscribing their ability to get around. A seat belt might seem exotic in some cultures in such situations, but is already viewed as indispensable in others. Many disabled persons wanting to free themselves from cultural paternalism will desire the additional option of travelling alone, but may then require a seat belt to provide needed protection from sudden stops and turns. Seat belts could also benefit tourists and visitors who are nervous about the chaos of city traffic. Parents with infants may want to either secure an infant seat or secure themselves when holding an infant. This July, I joined Holger Dalkmann of EMBARQ, Michael Replogle of The Institute for Transportation and Development Policy, and others on a United Nations panel to discuss inclusive transport as a key element in bringing persons with disabilities into the mainstream of economic development. Auto-rickshaws are finding a place on the agenda. A study by EMBARQ reported that six Indian cities with a combined population of 45 million were served by some 330,000 auto-rickshaws. The availability of even a small fraction of such fleets to include those with disabilities would provide a great boost to the use of para-transit services for final mile connectivity, and for short-range trips as well. Matters are coming full circle, and I welcome readers’ thoughts on the use of auto-rickshaws to enhance the mobility of persons with disabilities around the world. About the author: Tom Rickert heads up Access Exchange International (AEI), an NGO in San Francisco that has promoted inclusive public transit for seniors and disabled passengers for the past 23 years. He has compiled bus rapid transit (BRT) accessibility guides for the World Bank. Tom is a volunteer guest contributor to TheCityFix.